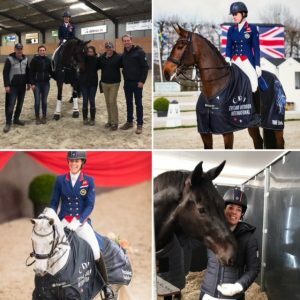 IC Dressage » International debut goes down a storm! International debut goes down a storm! We have just made it home from a very exciting trip to Holland for our first International dressage competition of the year. It was a competition that we have not been to before, a venue called Joosland in south of Holland, just 7 hours drive from Gloucester via the Euro Tunnel. We took two horses to compete, Charlotte’s grey mare Florentina for the Small Tour, and Mount St John studs’ bay mare Freestyle for the Big Tour. Both horses were making their International debut! As well as the competition horses we also took two horses for training so they could get used to the International atmosphere. These were Charlotte’s black gelding En Vogue and Carl’s bay gelding Hawtins Delecarto. The competition was a huge success for us, both Florentina and Freestyle won all three of the classes they entered. The only blip coming from Freestyle being a little over excited to show off in her first test, so a few communication issues dropped the marks down to 3 & 4 for some movements, but when she settled she was racking up the 8s & 9s! En Vogue and Delecarto both impressed in how they felt with their experiences. Next up for us in the Winter Championship at Hartpury next week. So I will keep you updated on how we get on there to.